It’s not easy to get placed with NFL teams — but athletic training students are building an impressive record for Central College. Seth Eash of Kalona, Iowa, completed an internship with the Green Bay Packers before returning for his third year in Central’s athletic training program. Eash is the latest beneficiary of the program’s alumni network — and a successful contender for a coveted internship. Eash landed the placement thanks to Nate Weir ’05, assistant athletic trainer for the Packers. Weir asked John Roslien, associate professor of exercise science, to recommend capable Central students, and Roslien encouraged Eash to apply. Weir also studied athletic training at Central, and Roslien helped him secure an internship with the Packers in 2004. Weir returned for a second internship in 2005, then took his current position in 2007. 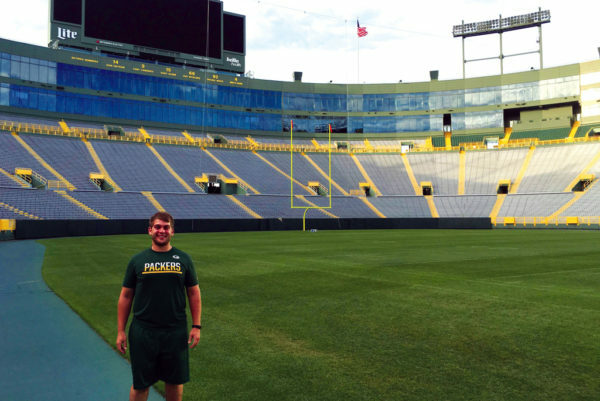 Seth Eash ’18 interned with the Green Bay Packers this fall. Other athletic training students have also completed internships with professional sports teams in recent years. Marcus Sojka ’10 also interned with the Packers, and Blaze Smith ’15 completed two internships with the Detroit Lions. “We have a long history of being able to place students with pro teams — the NFL, major league baseball, professional soccer,” says Roslien.